Does this mean the stupid search/replace functionality has finally been fixed? Once the search/replace marks/colors text there’s no way to clear it so when you’re replacing keywords the last one will be permanently marked with background color unless you reload the file or search for something else… Infuriating. It’s about the yellow / green background for search matches / replace items. But stating that you have to reload the file in order to remove the highlighting is completely wrong. If you dislike the persisting highlighting, just press ESC, and it is removed (yes, this is by design, and imho very useful). Maybe a good read: On being wrong. It’s about why it’s so hard to admit that you are wrong, and more. 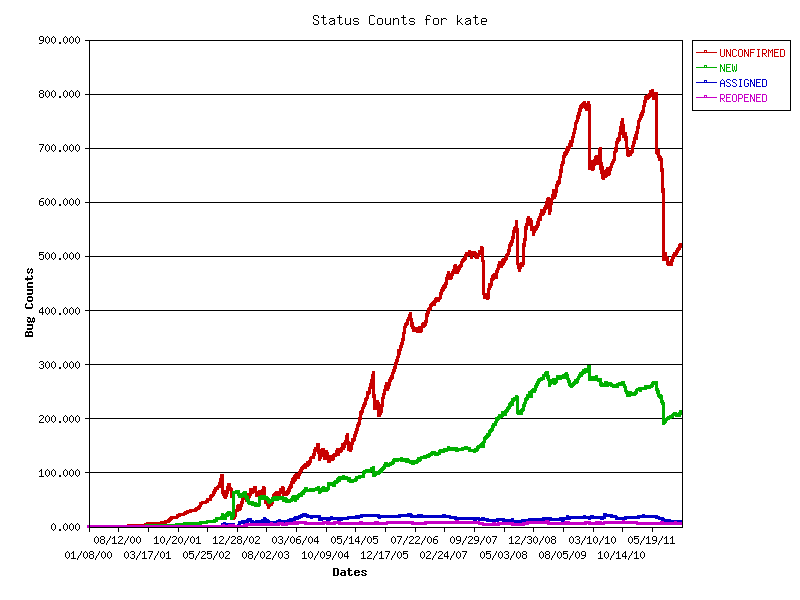 About half a year ago, Kate 3.7 was released as part of KDE 4.7. Now that KDE 4.8 is about to be released, let’s have a look at what Kate brings in KDE 4.8. As part of the Google Summer of Code (GSoC) 2011, the code folding code was improved. The main goal was to eliminate wrong folding behavior and fix all crashes while making the code more maintainable. We are quite happy with the results: Given the robust behavior, it now was possible to remember code folding state past sessions and during document reload. So folded regions are not lost anymore. Additionally, the visual appearance was changed to be rather decent. Also as part of the GSoC 2011, Kate’s vi input mode was heavily improved. Kate (and thus all applications use Kate Part) can be configured by using document variables, also known as modelines. Since it’s hard to remember all the available keys and values, a dialog helps out in the config dialog. You can read about all the details in this dedicated post (screenshots). T.C. Hollingworth put a huge amount of work into the Kate and KWrite handbook. Thus, the documentation is much more up-to-date and we hope it helps to learn using Kate effectively more quickly. The official version is available on docs.kde.org. Apart from the upcoming KDE 4.8 release, Kate turned 10 years old this summer. All in all, we can proudly say that Kate has a solid code base in its current state. The smart ranges were replaced by the moving ranges. Code folding is more clean with less bugs. Our plugins got a lot of updates. The documentation has improved. Of course, more help is always welcome. So if you are interested in Kate development, you are welcome to build Kate from sources and join our team by sending patches.